Winnipeg will see its first notable snowfall of the season today as warmer temperatures move into the region. Light snow will spread eastwards across the Red River Valley today, arriving in Winnipeg sometime mid-morning. While it won’t snow too heavily, it should stick around well into the evening before easing overnight into Thursday morning. 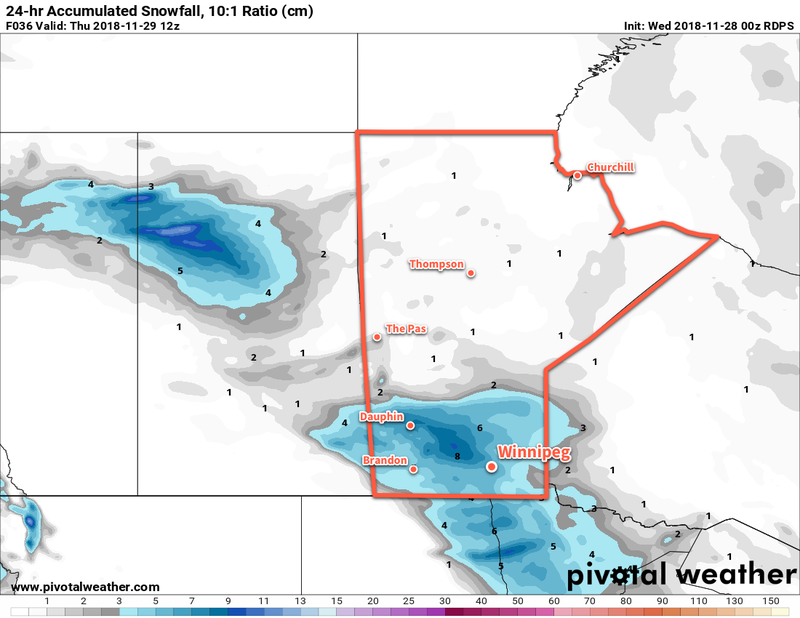 As a result, the steady snowfall will likely pile up to around 5 cm here in Winnipeg by the time it tapers off, but areas west of the city will see a bit more at 5 to 10 cm. Temperatures will be seasonable with a high near -5°C. Winds will be a bit breezy out of the southeast at 30 gusting 50 km/h. That said, the mild temperatures should limit any blowing snow that might want to occur across the valley. As mentioned before, periods of light snow will continue into the night with temperatures remaining steady near -5°C. Winds will ease into Thursday morning. Thursday will be a relatively pleasant day in Winnipeg as temperatures remain seasonably mild with a high near -3°C. Skies will remain overcast with a chance of flurries and winds will remain light. Skies remain cloudy for Thursday night with a low near -8°C. More cloudy weather will be on the way for Friday with highs near -6°C. Winds will gradually pick up out of the southeast once again to around 20 km/h. Skies will remain cloudy on Friday night with lows dipping to around -8°C. There’s currently a bit of disagreement on exactly how the weekend will go. Forecast models generally agree on the development of a Colorado Low that will move through the American Plains this weekend, however they disagree on how far north its impact will extend. Some models have snow and strong northerly winds in place over southern Manitoba this weekend. Others, though, keep it all to our south and leave us with cool but comparatively pleasant conditions. We’ll have more on what to expect in our next post on Friday. Winnipeg’s seasonal daytime high is currently -6°C while the seasonal overnight low is -14°C.